Cathy runs jewellery classes at her studio in Mortimer, near Reading in Berkshire and at other locations, including schools, craft events and private parties. Silver jewellery classes in the studio can be tailored to suit your interest and experience; these have included beginners workshops, workshops on an introduction to enamelling on silver, introduction to casting in silver, making each other's wedding rings, master classes on specific techniques such as soldering. Workshops can be on an individual basis or for up to four people at a time depending on the subject. As a qualified and experienced teacher Cathy is skilled at teaching all ages and abilities. Cathy is currently the jewellery tutor at Maiden Erlegh Community Arts in Reading where she teaches evening classes on Monday and Tuesday evenings. There is a often a waiting list for the classes. Contact Community Arts at the school directly if you wish to be added to the list. To book a private course please contact Cathy or call 07906 434680. He arrived with some gold fillings and by the end of the day had two gold band rings. You can make your old silver or gold jewellery into something new. She came from Switzerland to spend three days making jewellery in the studio. Cathy runs workshops out of the studio for other organisations. Here is a workshop run at a Craft and Design fair. ...to a piece of jewellery. Freeform casting in silver, one option for a day's workshop. 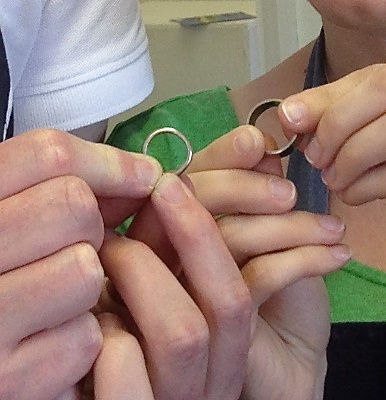 You can book a one day introduction to making silver jewellery online or give Cathy a call on 07906 434680. Buy a gift voucher for a special present. All group workshops are suitable for total beginners and those with jewellery making experience. Please contact to register interest for other dates.